Things are developing apace in Naomi 2. The girl has lots of questions, and though she doesn’t get any firm answers in this issue, there is a lot of interesting stuff teased for the reader. I am very glad Naomi confronted her adoptive parents about what they know of her true parents. It’s a dead end, but at least it was a rational action. And the series does ground itself very strongly in rationality. 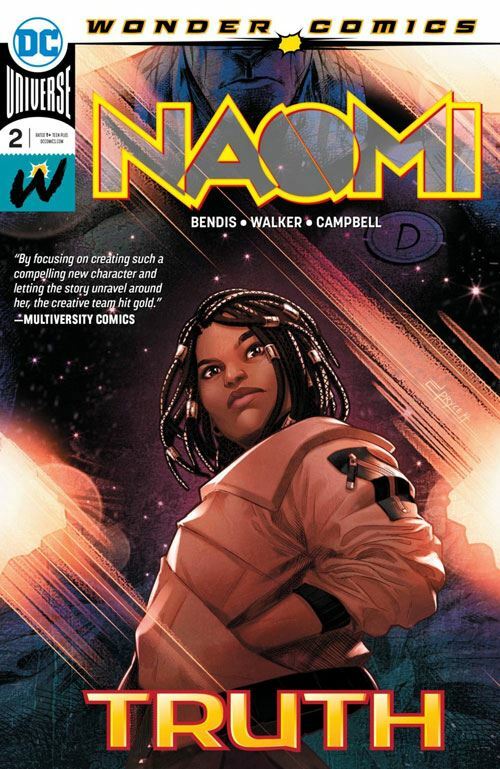 Really, the only major sense that this is a superhero book comes from the visions of heroes that Naomi has when she closes her eyes. Otherwise, this all feels very much like a story about a real person. There is only so long the mystery can be kept this much up in the air. Answers will have to start coming. So far there seem to be two main mysteries, Naomi’s parentage, and the way the town is completely ignored in the news. Probably these will tie together down the road. The big tease is not actually part of the story per se. It comes in the box for the next issue, promising the true history of the DC Universe. That’s a big order. What does Bendis have planned? So far I have had mixed feelings about his books for DC. Naomi is probably the one I like the best. But that could all change with whatever is in store. So it’s kind of hard to gauge this right now. I am enjoying the book, but that could all turn sour, depending on what next issue has to tell us.